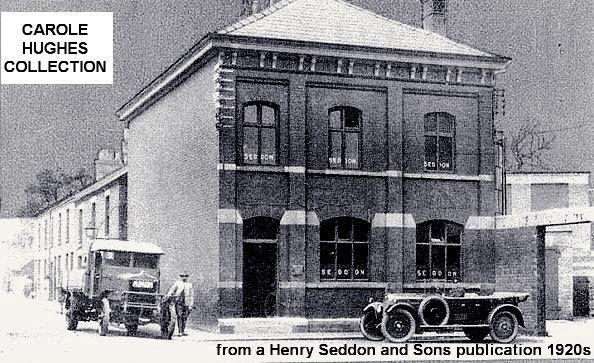 When Hentry Seddon & Sons Ltd issued the brochure from which the above illustration of the firm's Pepper Street offices is taken, they were obviously keen to make an impact as a modern, go-ahead company in the spirit of the age. Hence the somewhat stylised depiction of the Middlewich HQ seen here with the very latest in road vehicles parked outside, giving an impression of dynamic but quiet efficiency. Most of the photographs we use on A Middlewich Diary are very little altered before publication; sometimes we increase the contrast or alter the colouring slightly to make them a little clearer, but mostly they're pretty much as they always were. This is not the case with this particular photograph. The original was graced with blue spot colour in an attempt to give the impression of those perennial clear blue skies which everyone likes to think were once common over Middlewich. We've rendered the whole thing into black and white to make it look a little more natural. We're wondering if it's because it would have been too difficult to preserve the outline of the motor lorry on the left? Incidentally, as we've mentioned before, re-touching of photographs was very common in this era. Many people considered photographs to be almost akin to paintings, and the 'artistic license' afforded to painters - who often painted what they would have liked to have been in a scene, rather than what they were actually looking at - was extended to professional photographers too. The problem in many cases was that the methods used were crude, and they were often clumsily executed. We're wondering if the SE DD ON lettering in the windows was placed there especially for the photograph? It just doesn't look very convincing somehow. Or was it another little touch added during processing by the re-toucher? And why has one of the windows, top centre, been blacked out? But, in any case, the whole attempt at portraying businesslike, thrusting modernity is marred somewhat by some feckless member of the lower orders leaving his bike propped up in the open doorway. The re-toucher doesn't seem to have noticed. You can see these offices as they were after the works closed here . Note that in the later view of the office building (from the 1970s), that upper central window has been considerably altered. Geraldine Williams: This pic shows off perfectly the godsend side wall (not a window in sight) where we local girls honed our twosie-and-threesie tennis ball skills most evenings during the Summer.